This is one of the most popular hotels in this section. It is modern, with first-class table, elegantly furnished, steam heated and lighted by electricity. The proprietor, Mr. Mark Eagleton, is an experienced hotel man and understands the needs of his guests. Connected with the hotel are barber shop, billiard room, an attractive bar in which the best to drink and smoke may be had. 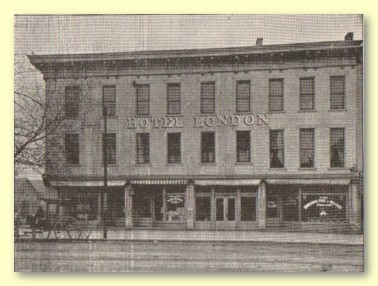 The London enjoys a large patronage, which is ever on the increase. Mr. John Pancake is the efficient and polite clerk who is sure to make friends with all.